Braden Holtby was strong, especially early with the Flyers spending so much time with the advantage. The first period saw the Caps killing penalties for the most part. John Carlson was called for a hook at 3:30, then Brooks Orpik was whistled twice — once for an illegal check to the head of a ducking Nick Cousins and later for interference. The Caps killed all three infractions though, and looked to create momentum from that in the second period. The Caps came out hard-charging and created several good opportunities, including Alex Ovechkin ringing one off the post. The calls started to even out, with the Caps drawing three penalties in the frame. They made good on the last — a delay of game off a deflection by Brandon Manning. On that third power play, Nick Backstrom handed off to Marcus Johansson at the half wall, and Johansson fed John Carlson at the point. Carlson’s big blast deflected off defenseman Chris Vandevelde and past Steve Mason for a 1-0 lead at 16:21 of the period. More buzzing ensued, but the Flyers escaped the period surrendering just the one. That didn’t help the Flyers in the third, though, as the Caps dominated again. A four-minute high-sticking minor didn’t bear fruit, but it allowed the Caps to continue the offensive pressure, wearing down the Flyers. After a four-on-four stint ended, Marcus Johansson gathered a loose puck and fed Jay Beagle streaking down the slot. Beagle pounded it past Mason to give the Caps a 2-0 cushion with just over three minutes to play. All that was left was for Braden Holtby to collect an 18-save shutout and the Caps take a 1-0 series lead. It was a physical game, as one would expect from these long-time rivals. 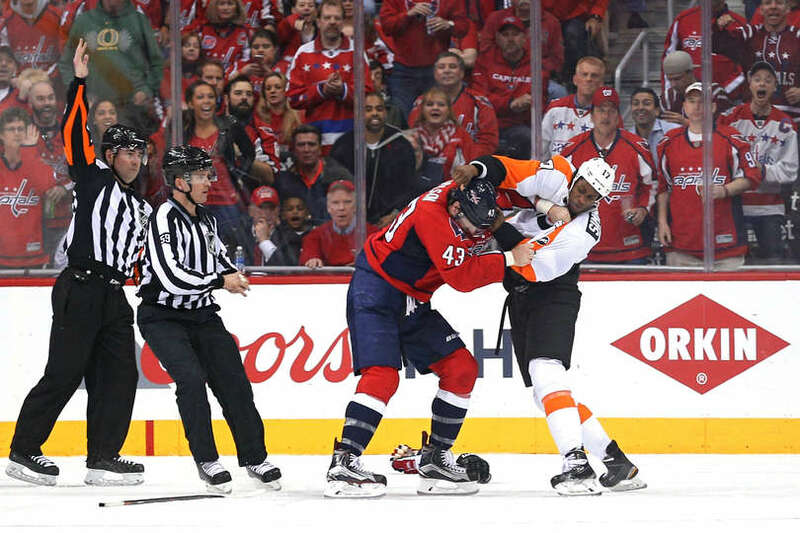 The hitting was intense, with Alex Ovechkin knocking Sean Couturier out of the game with an upper-body injury on a clean hit, and boiled over late, as Tom Wilson was called for boarding and Wayne Simmons retaliating — with both players send off for fighting. Then at the final whistle — another scrum. Brayden Schenn — who had several jumping high hits earlier in the game — took a run at Karl Alzner at the horn, with the teams coming together for final pleasantries before heading to Game 2 on Saturday night.